Contact Lone Star Toyota today for information on dozens of vehicles like this 2018 Toyota Camry XSE V6 Auto. Everyone hates the gas pump. Skip a few gas stations with this super fuel efficient ToyotaCamry. There is no reason why you shouldn't buy this Toyota Camry XSE V6 Auto. It is incomparable for the price and quality. This is about the time when you're saying it is too good to be true, and let us be the one's to tell you, it is absolutely true. You could keep looking, but why? You've found the perfect vehicle right here. Lone Star Toyota is excited to offer this 2019 Toyota Highlander. Want more room? Want more style? This Toyota Highlander is the vehicle for you. There's a level of quality and refinement in this Toyota Highlander that you won't find in your average vehicle. Enjoy safety and stability with this all-wheel drive vehicle and drive with confidence in any condition. The Toyota Highlander Hybrid Limited Platinum V6 AWD will provide you with everything you have always wanted in a car -- Quality, Reliability, and Character. This 2018 Toyota Sequoia TRD Sport is offered to you for sale by Lone Star Toyota. Want more room? Want more style? This Toyota Sequoia is the vehicle for you. Pull up in the vehicle and the valet will want to parked on the front row. This Toyota Sequoia is the vehicle others dream to own. Don't miss your chance to make it your new ride. This is the one. Just what you've been looking for. This vehicle won't last long, take it home today. You can find this 2018 Toyota Land Cruiser and many others like it at Lone Star Toyota. Want more room? Want more style? This Toyota Land Cruiser is the vehicle for you. There's a level of quality and refinement in this Toyota Land Cruiser that you won't find in your average vehicle. This 4WD-equipped vehicle will handle majestically on any terrain and in any weather condition your may find yourself in. The benefits of driving an Four Wheel Drive vehicle, such as this ToyotaLand Cruiser , include superior acceleration, improved steering, and increased traction and stability. There is no reason why you shouldn't buy this Toyota Land Cruiser . It is incomparable for the price and quality. Contact Lone Star Toyota today for information on dozens of vehicles like this 2018 Toyota Land Cruiser . Want more room? Want more style? This Toyota Land Cruiser is the vehicle for you. Pull up in the vehicle and the valet will want to parked on the front row. This Toyota Land Cruiser is the vehicle others dream to own. Don't miss your chance to make it your new ride. With 4WD, you can take this 2018 Toyota Land Cruiser to places roads don't go. It's all about the adventure and getting the most enjoyment out of your new ride. This 2018 Toyota Land Cruiser is proudly offered by Lone Star Toyota Want more room? Want more style? This Toyota Land Cruiser is the vehicle for you. Pull up in the vehicle and the valet will want to parked on the front row. This Toyota Land Cruiser is the vehicle others dream to own. Don't miss your chance to make it your new ride. This 4WD-equipped vehicle will handle majestically on any terrain and in any weather condition your may find yourself in. The benefits of driving an Four Wheel Drive vehicle, such as this ToyotaLand Cruiser , include superior acceleration, improved steering, and increased traction and stability. This is the one. Just what you've been looking for. New vehicle pricing includes all offers and incentives. Tax, title, tags, and $149 dealer documentation not included in vehicle prices shown and must be paid by the purchaser. Dealer added accessories for $1895, the LST Protection Package. Manufacturer’s rebate subject to residency restrictions. Any customer not meeting the residency restrictions will receive a dealer discount in the same amount of the manufacturer’s rebate. While great effort is made to ensure the accuracy of the information on this site, errors do occur, so please verify information with a customer service rep. This is easily done by calling us at (469) 470-2395 or by visiting us at the dealership. **With approved credit. Terms may vary. Monthly payments are only estimates derived from the vehicle price with a 72-month term, 4.9% interest, and 20% down payment. 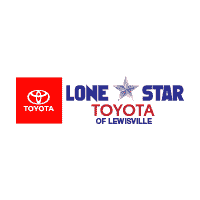 Lone Star Toyota of Lewisville	33.0213337, -96.9874464.